Gabel Acres provides all inclusive, quality practical individualized care for you and your equine partner. On site proprietor has over 40 years of teaching, training and boarding experience. You will not worry how your horse is doing in your absence! They will be taken care of as if they were owned by the proprietor. Only a few people will oversee the daily care and handling of the horses so consistency of that care will be maintained. Gabel Acres offers 12’x12’ well ventilated, deeply bedded, clean stalls. Each stall has a fan, two water buckets that get filled daily and dumped if needed. Buckets are disinfected on a weekly basis. Proper feed requirements will be met. Hay will be plentiful, and regular worming is included. Any provided supplements will be fed properly to your horse only. No hidden fees for extras. All horses will have safe turn out options. Mares and geldings are kept separated. 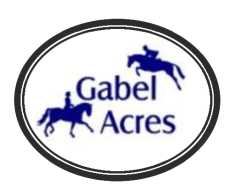 Gabel Acres is also a breeding farm of warmblood horses so there are horses all ages. They all will be kept and handled in an age appropriate environment. Gabel Acres has a 115' x 250' outdoor arena that drains very well and has a watering system and lights. In addition, there is a 70' x 200' covered arena with high quality footing and lights. We are easily accessible: we are 1/4 mile off Hwy 73; less than 3 miles from exit 25 off I-77; and 10 miles from I-85 at Concord. Care for both horse and rider is individualized and proprietor/caretaker lives on site.